U.S.-based MariMed bucked the downtrend in the cannabis sector last month. Here's what investors should know. Shares of MariMed (NASDAQOTH:MRMD) jumped 18.9% in October, according to data from S&P Global Market Intelligence. The S&P 500 declined 6.8% last month. MariMed, based in the Boston area, describes itself as a "multi-state cannabis organization that develops, owns and manages cannabis facilities and branded product lines." MariMed stock's performance last month was notable since nearly all the stocks in the marijuana sector took a beating, except for it, fellow U.S.-based player MedMen (a high-end retailer and grower), and Canada's Origin House (formerly known as CannaRoyalty, a grower that's targeting the California market), as fellow Fool contributor Sean Williams wrote. For instance, shares of Tilray (NASDAQ:TLRY), Canopy Growth Corp. (NYSE:CGC), and Aurora Cannabis (NYSE:ACB) -- the three largest marijuana stocks by market cap, in that order -- plunged 34%, 24.2%, and 29.2%, respectively, in October. MariMed is an early mover in the U.S. cannabis market. Image source: Getty Images. 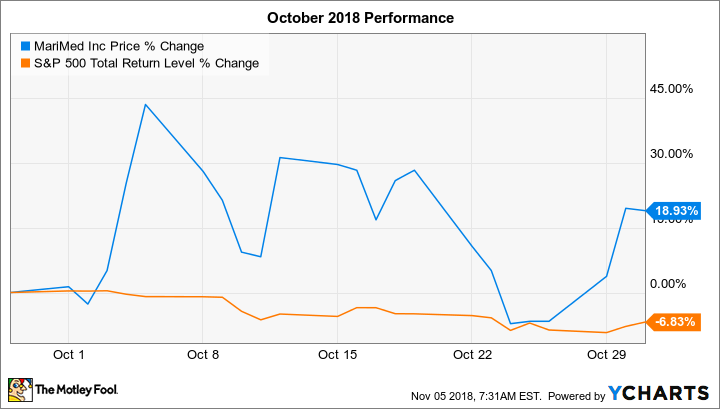 We can attribute MariMed stock's October performance to its announcement on Oct. 29 that it had closed on its acquisition of BSC Group, a New Jersey-based cannabis licensing and consulting firm. (The acquisition price was not disclosed, nor was information on how the deal was financed.) Shares had been in the red about 7% for the month through the date of this news, when they closed up 11.1%. Over the three-day period through Oct. 31, MariMed stock gained more than 27%, bringing its monthly gain to 18.9%. Brian and Amber [Staffa, the owners of BSC Group] will help guide MariMed's strategy for new markets like New Jersey, where lawmakers inch closer to consensus on adult use legislation. New Jersey represents just one of the markets being eyed by MariMed as [we] aggressively pursue new opportunities across the U.S. and abroad with their [BSC's] added bandwidth. We can largely attribute the cannabis sector's general downtrend last month to some selling after the big run-ups over the previous couple of months in anticipation of Oct. 17, when marijuana became legal for adult recreational use in Canada. For inquiring minds interested in the bigger picture, the following chart shows how MariMed has performed in 2018 through last week. Canopy Growth and Aurora Cannabis are included for context. 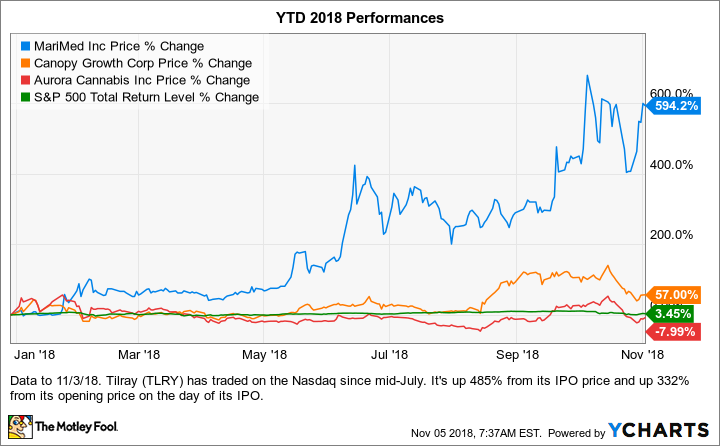 Tilray has only been trading on the Nasdaq since mid-July, though its performance since then is included in the notes at the bottom of the chart. Investors comfortable with high risk might want to put MariMed on their watchlist, as it has a rather unique business model and is positioning itself to be a major beneficiary when marijuana becomes legal in the U.S. on a federal level. Notably, it's one of the few pure-play marijuana stocks that's cash flow positive from an operational standpoint. That said, it's also currently a very risky stock because the company has big financial hurdles that it will soon need to overcome. MariMed had $5.1 million on its balance sheet at the end of the second quarter and burned through $17 million over the trailing-12-month period through the end of that same quarter. At that cash-burn rate, MariMed's cash would last less than four months. It's more challenging for marijuana companies to borrow funds from traditional sources, like banks, because cannabis is illegal on a federal level in the U.S. And the fact that the company's stock trades over-the-counter in the U.S., rather than on a major stock exchange, makes raising funds through equity offerings more difficult. While no firm date has yet been announced, investors can probably expect MariMed to report third-quarter earnings around the middle of this month. You'll want to focus on the company's cash-burn rate and cash position, which are sure to have changed over the last quarter. For one, MariMed reported in mid-July that it received a $2 million investment from Navy Capital Green Fund. However, on the debit side, in September, it made a strategic investment (amount not disclosed) in Sprout, a customer relationship management and marketing software company for the cannabis industry.